There is the Weston A. Price, the Paleo, the Vegetarian, the S.A.D. (Standard American Diet), GaPS, Blood Type, Vegan, and many more diets, all claiming to be the best. How do you pick one? Jeremy, my Mama, and my sister have all being doing the Whole 30. I haven't, because, well, I like milk, butter, and bread. But it has got me thinking, about why I don't trust diets. I've written before about my reasons for trying to live this lifestyle; it's to put my dependence on God and not on man. This takes a long time, we are tangled up and ensnared in our dependence on the industrial food system and the government. 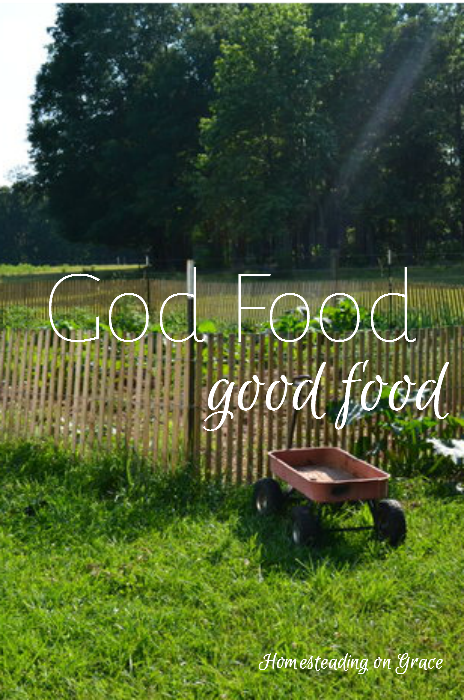 I believe that God created us, and created our food sources. Things may have changed after the Fall that required that we eat meat and I believe a lot of that has to do with understanding sacrifice for our own living. Which, ultimately, points to Jesus. Maybe that's the biggest problem with the industrial food system. It makes us believe we don't need the sacrifice of others in order to live. We don't know about the sacrifices of the farmers or the animals since we just pick up whatever we want nicely packaged in the grocery store. When we don't know we need sacrifice, we start believing we don't need the Sacrifice. I want to know. I want to know about the sacrifices. I want to know about the cost of my life. And I want my kids to know too. I want to eat the foods God created for my body to consume. Because He did some pretty cool things with food. One of the big health concerns in our country today is bread. Well, it's kind of funny that we are having so much trouble consuming our industrially made bread that only takes a few minutes to make. It's because we aren't consuming the wheat as God intended. You see, He put the very thing we need to digest wheat in the wheat! But when you don't use what He put in, then you can't really digest the bread. Our industrial food system didn't have time for God's yeast and sourdough, plus they wanted us to have more sugar, so they came up with a yeast of their own. To make bread rise with God's ingredients, you only need flour and water and time. And while we do have damaged guts from eating bread incorrectly, real bread is very good for us. It's been a staple of the human diet for thousands of years. But since we've changed it, we are having problems with it. We need to go back to sourdough, and preparing the wheat so that our bodies won't get inflamed, and can digest the nutrients in wheat. It just takes time and is actually much cheaper than the cheap white bread at the grocery store. Milk is another food that is up for debate. It's funny too, though. Milk also has the ingredients in its raw form for us to digest it. God put them there. But when we pasteurize and homogenize that milk, we break up the enzymes and lactase and make it impossible for our bodies to digest it properly. It's the same with the bread. God made milk with the ingredients we need to digest it. And yes, we are the only creatures to take the milk of animals for our consumption. But, many animals love getting milk from other animals. (Cats, chickens, pigs etc.) They just lack the thumbs. So no, they can't take it, but they do enjoy it. We shouldn't really compare ourselves to animals anyway. We aren't animals. If you read here often, you know how I feel about cleanliness. Pasteurization came about because animals weren't being cared for properly, and instead of cleaning up the animals' environments, they cleaned up the milk. They maybe should have taken care of the environments. I am very careful to keep our milk clean, and I don't hesitate to dump it, or heat it to 180 degrees to make a quick cheese if I think it's been exposed to anything. But miracle of miracles, it has not made us sick. Speaking of animals, let's talk about meat. I believe our bodies now need meat in order to best survive. (Whether it was always this way, or will always be this way is to be seen.) But meat should be very different from the mushy stuff we eat these days. The first time we had a chicken from our flock on our plates, we were appalled at how tough it was. I mean, we actually had to chew. We couldn't just inhale. I've been doing some research lately into teeth because Eowyn's teeth are going to need some work. Our teeth and, more importantly, our mouths need to chew. It's how our mouths grow big enough to accommodate all of our teeth. Since we are basically drinking our food down these days, our mouths are getting smaller and smaller, but we still have the same amount of teeth. This is a big problem now! Most people need dental work. If we were chewing meat that had been raised as God intended, we wouldn't be running into this problem. The mushiness of food leads to another problem with the industrial food system. They are producing food in order to addict us, to trick us into eating more, and to nutritionally starve us. Cheetos are made to dissolve in our mouths to trick our brains into thinking we aren't getting anything in our stomachs. So we just don't stop eating them! Doesn't that make you angry? It does me. The food industry only cares about the profit. So what kind of diet do I want to have? A God food diet. Eating foods the way He intended and created. So I milk my goats every morning, and collect my eggs and vegetables, and praise God that I can walk past those aisles in the grocery store. There are other ways of depending on God, by shopping at the Farmers' Market, and buying locally, etc. You don't have to get a couple of goats, but for us, it was the most economical way to gain independence from the industrial food market. It's not that those other diets are bad, or even that the Whole 30 is bad. We do need healing. And sometimes that means abstaining from foods. There are plenty of times in the Bible when abstaining from foods is used for the betterment of people. But I believe it is also essential that we learn the ways of God's food. We can learn and then figure out what we're going to do about it. When we learn about sourdough, we can either learn how to make it (it's really simple) or find a sourdough baker. One of the arguments against local, organic farmers/bakers/candlestick makers is that they would never be able to produce the quantity of food that the industrials farms can. And that's true. But you know, our country is short on jobs right now. So maybe we could have a few more farmers. And the other thing is, the quantity of food that the industrials farms produce is actually too much. Our country is, well, overweight. We don't need more food. We need less food with more quality. So more organic farmers would actually help us out in two ways. Part of the homesteading movement is to be independent. I don't really agree that that's a way God intended us to be. He created us for relationship, so community is vital to our well-being. What does work well is a community of producers working together for the good of the community. The baker bakes, the farmer grows, the butcher processes. Everyone knows each other, and when the chickens aren't laying, nobody gets eggs. I also linked to several sources in the post above. 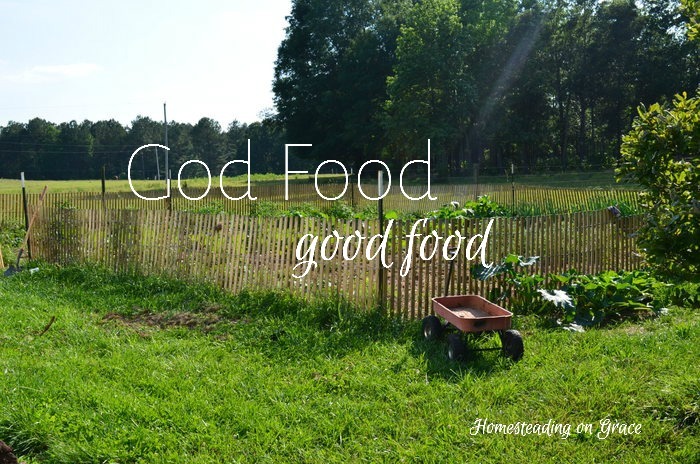 What are some steps we can take to build a community around God food? Share your ideas in the comments, and let's dialogue about it! I absolutely agree with you. God did not intend for our food to be genetically modified. He made it exactly the way our bodies needed it to be. I blame many of the food allergies/intolerances on genetic modification; if you look at the top ten food allergies, all of those foods have been modified in some way. And back years ago, before all this started, you didn't hear about food allergies. God and His Food for us is already perfect; it doesn't need or require modifications. I hope to start some gardening for my family next spring, and I've been looking at heirloom seeds to avoid the genetic modifications. I enjoy reading your aricles. I would like to see more of your writings about foods and diets. Exactly, God knew what He was doing, and is still doing. The world still doesn't trust Him though, just like Eve. Thank you Skippy! Respectfully and thankfully, I love that Alice! Amen! And thank you for that correlation between accepting God's provision of meat and the provision of the Ultimate Sacrifice! I have never heard it that way and it totally hit home! I've been trying to explain to my children why we eat meat and may one day need to sacrifice our laying hens. I've been going with the 'only one bad day' viewpoint. But this goes even deeper! I will be passing this on to my family and friends! I'm so glad, Jessica! It's a completely different experience to take the life of an animal for your own table, but it gave me and my kids such a good perspective. We just can't live well without sacrifice. We need Him.